Are electronic chessboards hybrid computers? Re:Are electronic chessboards hybrid computers? So it uses an hybrid source of energy. The curve is the analogical signal, the histogram is the numeric copy (like a Tuner hydrid for numeric and analogic TV channels). In your case, the sensors of the chess-board detect only the presence or the absence of pieces (system “all or nothing”). binary data thus numerical! 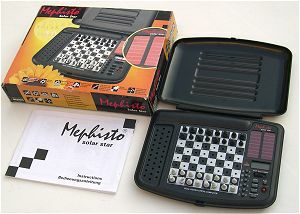 When considering the adjective "hybrid" this afternoon, just because it came across my way, I thought to myself that an electronic chess board like my Mephisto Atlanta is a hybrid computer, too, isn't it? "Hybrid", explained in simple words, means that two different systems are united in one case. For example, a hybrid computer is a computer, which consists of an analog part and a digital part. The analog part measures data and passes them on to the cpu where the analogously detected data are processed digitally and the results are put out in digital or analog form. Another example is a modern library where there are real books with real pages and digitally scanned books which you can read only on screen. This is a hybrid library. It contains two different kinds of libraries under the same roof, in the same building. My chess computer also has both an analog and a digital part. The analog part is the board with its chessmen which stand on this or that square. The information about the pieces are sent via sensors to the processor which handles them digitally and puts out the result partly digitally (display) and partly analogously (blinking red small lamps). So my Atlanta is a real hybrid computer, right?